The customization of materials has been made easy by making use of heat press machines. They allow users to customize anything and are responsible for the coming up of many printing businesses. It is important to select the best heat press machine so as to enjoy the benefits that come with it. Some of the benefits of choosing the right equipment include; the ability to make quality prints, ensures the ease of use and affordability. 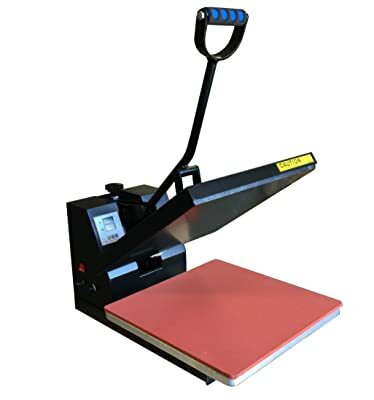 The following guide will help you to determine the best products available, what to consider before buying the right heat press, and how to use and maintain it after purchase. 1.1 1. Hotronix Fusion 16″x20″ Heat Press Swing – Heat Transfer Press Machine Built To Last! 1. Hotronix Fusion 16″x20″ Heat Press Swing – Heat Transfer Press Machine Built To Last! It is a unique machine that is a combination of a swing and draw. The draw allows leaving the heating element in a stationary position so as to load and unload the platen. This promotes threadability and flipping of the material to decorate the back and front without removal from the press. The heat press does not radiate heat when at work. This is a great feature because the workspace is kept fresh and convenient place to work. It has a touch screen display that allows monitoring and easy changing of settings depending on the project. The controls are digitally designed with time and temperature readouts which make navigation simple. Also, it has a pressure adjustment function that is patented. It plays an important role as it allows edge to edge heating and the even application of pressure. The dimensions of the machine are 16” by 20”. The frame is constructed using an aluminum alloy which makes it durable. The opening of this heat press is 10% bigger than other products available. This difference allows the user to accurately and safely position the material being worked on. The larger opening also provides a simple layout of letters, numbers and transfer materials. 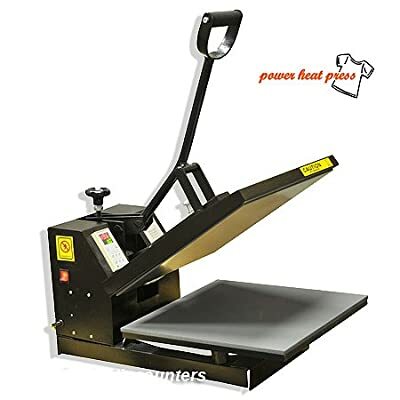 It is a clamshell type of heat press that comes in 15” by 15” size. It is compact and saves on space since it opens upwards. The plates of the media are non-stick, scratch resistant and are coated. It has a power of 1800 W and 110 voltage. The temperature generated starts from 0 to 500 Fahrenheit and a response time of 0 to 999 seconds. These features allow the heat press to handle both semi and professional projects. The pressure is adjustable creating room to use different materials. A stopwatch is also available to control the time of contact and prevent overexposure. When the set time is up, the user is alerted by a beep. The stability of the machine is enhanced by a base board made of silicone. The DG heat press is a product that measures 15 by 15 inches. The plate is coated with Teflon. It has a voltage of 110 volts and power of 1800 watts. It has an electronic heat and time control that allows the user to set-up precise measurements for desirable results. The base of the product is made of silicone gel which is not glued down. This feature promotes the stability of the machine during use and makes it simple to maneuver. This product is compact with a model of opening upward that helps to save on space. The press comes with an extra Teflon sheet free of charge. It is ideal when applying letters, transfers, images and numbers. The products that the application can be made is bags, garments, t-shirts, ceramic tiles and ID badges. 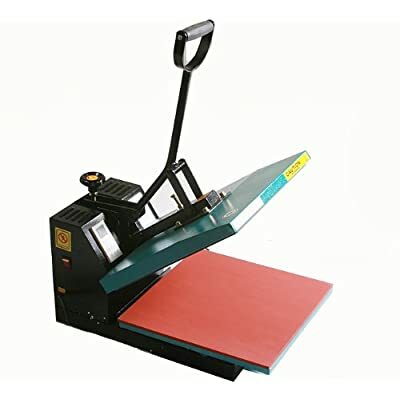 The F2C is a heat press 15 by 15 inches in size that is made with heavy duty material. The heavy duty material makes it durable and reliable. It has a power rating of 1200 W and a voltage of 110V. The temperature and time range is between 0 to 400 F and 0 to 9999 seconds respectively. All the sections of the press such as the nuts and bolts are compactly made to perform their functions. The platen has a Teflon coating and a distinct thickening that ensures consistent heat transfer and stability. Operating both for new and experienced users is simple. Any challenge in operation can be readily clarified in the user manual that comes with the product. The machine is welded with sturdy steel which makes it scratch resistant. It has time and temperature controls that are intelligent with a memory function. This feature enables the user to pre-set these settings providing the desired results. To further assist, an automatic countdown is put in place to monitor the progress. Also, an alarm and a signal indicator is present and notifies when the precise settings are reached. The safety during operation is enhanced by the dual electrical protection. 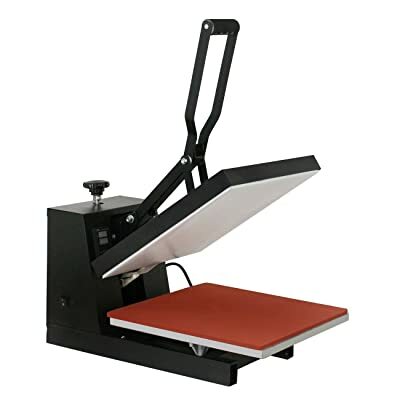 The digital heat press has a flat 15 by 15-inch size constructed with a steel frame. It has a full range of temperature and heat adjustment controls that make it easy to navigate. It has an input voltage of 110 to 120 volts and a press temperature of 0 to 500o F.
It is a compact product with the model of upward opening which utilizes space. It is able to apply transfers such as numbers, letters and images on garments, mats, bags and IDs. Before settling on the best heat press machine, here are some of the factors to consider to ensure your operations run smoothly. A large heat press is better to accommodate all sizes of fabric materials. It also makes the transfer process easy since there is adequate space to fit and place the material. Another important thing regarding size to consider is if the machine will be moved a lot or it will remain in a particular location for an extended period of time. If there will be constant movement, it is advisable not to get a gigantic one for ease of movement. The sizes to choose from are a 15 by 15 inch and a 16 by 20. Finally, consider the space available to store the machine as it is a factor. It is advisable to stick to whatever budget set since there are many products to choose from that work fairly well. Pick a machine that meets all the needs you have. When shopping around for a machine, consider products from reliable manufacturers who put the needs of the users first. Check for companies that offer immediate aid in case of any trouble in handling or damaged parts. An excellent way to get this information is through buyer reviewers from the main e-commerce sites. Another issue to consider is the warranty offered. Choose a product with the best terms for you. The quality of the materials that make up the parts of the machine is crucial as it will determine the durability. The product should be able to resist scratches. Also, the heat plate which is the most relevant section should be made of material that supports the transfer process. It should also be able to distribute pressure and heat evenly for excellent results. The quality is usually determined by the weight since quality materials are heavier. The controls on temperature and controls should be easy to understand and set up depending on the project. Many of the products have a digital system which goes further to alert the user when the time of exposure elapses. These controls prevent damage to the fabric to bring out an attractive finish. The time and temperature ranges vary from 0-9999 seconds and 0-500F respectively. A machine with a greater range of both time and temperature is better as it creates room to work with varied settings depending on the fabric. The artwork can be in the form of an images, letters or numbers. To come up with the best design, a graphic design software is recommended to create room for edits and improvements. After the final layout, place the artwork in a flipped position so as to mirror it. The transfer paper is the medium in which the artwork will be transmitted to the fabrics. It should have an opaque or clear film. A clear film is best suited for white or light grey materials while the opaque film is better for the other colors. This is to ensure that the exact printed is transferred without additional parts. The process involves plugging in the heat press and setting the desired temperature and time. When the machine heats up to the temperature you want, a red heating light may appear. A digital timer if available should be started and the process stopped when the alarm goes off. The fabric should be put on the working table of the heat press having been well spread. The transfer paper is then placed the film facing down. The heating plate is finally brought down to effect the transfer process. With the timer and temperature all set up, remove the heating plate when that set time elapses. The final step is to peel off the transfer paper from the fabric and the process is complete. Place the end product in a spread position to avoid any interference with the print. Give the material adequate time to lock the print before washing. It is also important to know the type of material being used since not all fabric can be worked using the heat press. Knowing the material also helps in setting the right temperature and time. Protect the silicone rubber pad at the base of the heat press that is responsible for stability. Keeping it safe promotes even distribution of heat and pressure when in use. The section can be shielded by applying a Teflon cover. Lubricate the machine often to eliminate stress on the pivot points. Maintain automatic style machines by cleaning the air system. The cleaning prevents the accumulation of dirt and dust particles that clog the system. Use inkjet printers to print on the transfer paper to produce quality prints. Use the right transfer paper on the heat press machine based on the color of the fabric. Investing in the best heat press machine is not an easy process as many considerations need to be made. These include the budget, quality, the controls and the manufacturer. Making the right choice enables the user to produce high-quality prints that appeal to consumers. It is also crucial to know how to use and maintain the chosen heat press correctly. 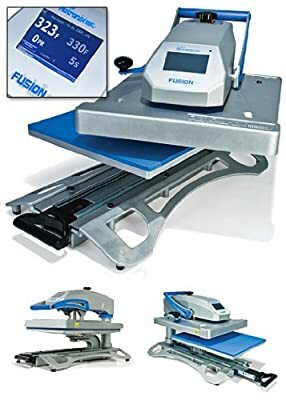 From the list of discussed machines, I would recommend the use of the PowerPress Industrial-Quality Digital 15-by-15-Inch Sublimation T-Shirt Heat Press. This is because it has the right size to fit a number of materials and it is made from quality materials that make it scratch resistant. Also, the temperature and time ranges are adequate. Finally, it is easy to use with electronic control that helps produce desirable results.